In the year 2280, an alien fleet attacked the Earth. Their weapons were unstoppable, their defenses unbreakable. Our technology was inferior, our militaries overwhelmed. Only one starship escaped before civilization fell. Earth was lost. It was never forgotten. Fifty-two years have passed. A message from home has been received. The time to fight for what is ours has come. What made the experience of listening to Man of War the most enjoyable? Gabriel Saint Martin. Can't say, don't want to spoil the story for anyone. Man of War is the 1st book in the Rebellion series by science fiction writer M.R. 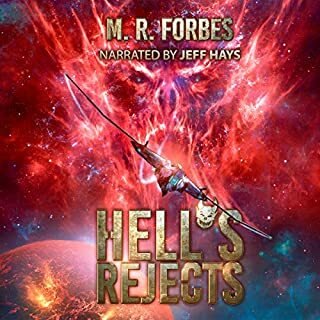 Forbes and brought to life in audio format by the tallented voice over artist Jeff Hays. This is my first contact with both author and narrator and I can say that I’m impressed. Although I’m not a Sci-Fi fan, I enjoyed this story a lot and in the following lines I’ll tell you why you should give it a try. The story in Man of War takes place long after humanity finds a way of traveling to the Stars, but there we encounter other intelligent life forms. There we meet The Dread, a species of aliens, more powerful than we are, more advanced, and they are not friendly! After a war in which we can’t even defend ourselves, losing bilions of lives, Earth is abandoned by the few thousands remaining alive and a some are left behind, forming some sort of a resistance to keep the Dread busy while the others escape. The actual plot picks up after 52 years from these events and switches between those fortunate enough to have escaped in the starship Magellan, who formed the New Earth Alliance somewhere far from the planet and the few survivors of The Resistance, left to fend for themselves on ruined Earth as they fight an unwinable war. Both factions are lead by heroes, by men of war who never stopped hoping, who never stopped planning, who want Earth back. This is their story! The story of Starfighter pilot Captain Gabriel Saint Martin and of Major Donovan Peters. We get to know them, we get to care for their wellbeing, we discover dramatic stories. We see them fight, we see them cry, we see them hurt and we see them as they find hope and cling to it. They have to work together to win back their home! Author M.R. Forbes delivers a compelling story, driven by a great plot and filled with rich and deep characters. From the first sentences the book pulls you in and it doesn’t let go until the end, at which point you are left wanting for more. The personal dramas each main character had endured, the indestructible enemy, called The Dread that lives on Earth in cities made from spaceships, the brilliantly written dialogues and the tense actions scenes make Man of War a sure hit for fans of the Sci-FI and Military thrillers genres alike. 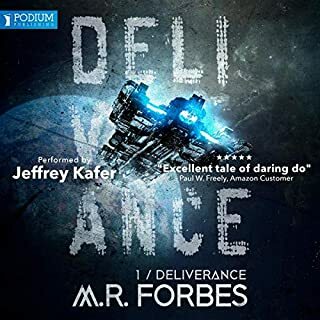 As I said in the beginning of this review, this is the first time I experience an audiobook performed by narrator Jeff Hays and I liked his solid performance. Straight from the opening sentence he immerses you into the great story, pulling you in with a full range of voices and accents. He is one of those actors that can switch between characters in a way that you’ll think that you are listening to a full cast recording. Jeff has that very rare talent to give life to male and female characters without becoming ridiculous or pathetic in the process. His narration style reminds me of MacLeod Andrews‘s, but Mr. Hays has his own tricks up his sleeves and he is original in his own personal way. I finished listening to Man of War about five days ago, but the story, the characters and Jeff‘s performance are still lingering in my mind. I took this time to put my thoughts in order and I realised that I’m willing to give more chances in the future to Sci-Fi books. My experience in this genre is limited to the Star Trek tv series of which I’m a big fan, to the Mass Effect video games series and to Dune, the movies. I need to listen to the books some day. 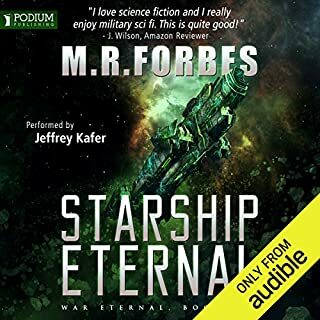 As a parting remark, I suggest that you listen to the sample from Man of War on Audible and I’m sure you’ll like it. After that, if you prefer Science Fiction books filled with vivid characters and with thrilling action you can’t go wrong with this one. Hope this review was helpful and I'd appreciate if you could vote Yes below. An enjoyable take on the alien earth invasion story. While the plot seems too coincidental and too timely at times, the author makes up for this with his unique skill at creating a cast of characters and situations that keeps one's interest flowing. The narrator was very good and had an excellent dynamic range that made it clear when jumping between genders, age groups and cultural accents. I'll be on the lookout for audible book 2.
starts out slow. but believe me it picks up well. can't wait for the next one!! If you could sum up Man of War in three words, what would they be? What was one of the most memorable moments of Man of War? Man of War was great! The story started off a bit slow, alternating between Donovan and Gabriel's POVs, but as M.R. 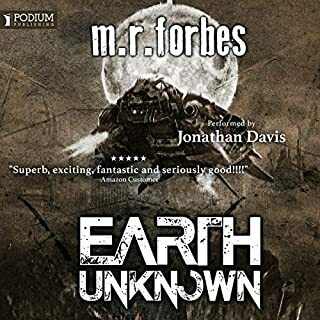 Forbes develops the plot and characters, it starts picking up steam, and before you know it, it's moving at a fast pace, and heading towards intense. As it's developing, you are not only sucked in by the narration, but by the captivating plot full of suspense, action, drama, and amazing characters. I truly enjoyed this story, and all the twists! Looking forward to book two! Jeff Hays narration is like a "one man show!" He's such a skilled narrator, who can successfully project a wide range of characters, voices, and emotions. His performance really enhanced the story, and pulled me right in! I loved all the character's voices, especially Theodore, and his Cajun accent. A great Sci-Fi, sure to satisfy even the most die-hard fan! 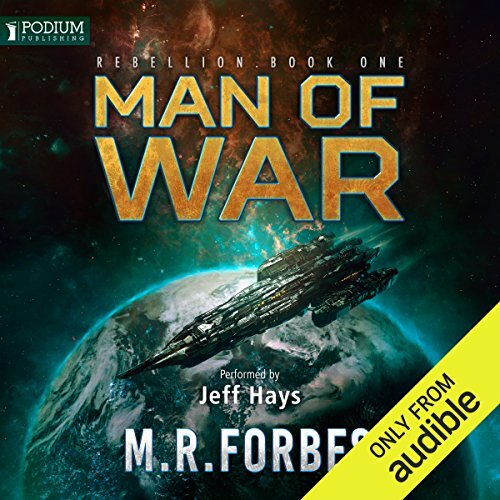 Where does Man of War rank among all the audiobooks you’ve listened to so far? I went through my SF era about 40 years ago. The likes of Asimov, Heinlein, Herbert et al. I KNOW good Science Fiction when I encounter it. This is my first encounter with M.R. Forbes and I am impressed.A narrator is like a carpenter. He can build rickety walls with good material and poor craftsmanship, or work with the materials and build something others can enjoy for a long time.Jeff Hays is a craftsman. He adds so much to his narrations.With these criteria, this is up in the top 10 of the Audible books I own. I think the realistic development of mechanics of machinery, and the emotional and physical abilities by humans in declining civilisation brought on by alien invasion. The alien invasion isn't new to the genre. The reality is - Batteries run out, the characters resort back to primal survival abilities. Are two examples. As stated, Jeff Hays is a master at his craft. He can do voices across every spectrum. Timing, empathy for the characters. You can tell... he loves his work and the material he chooses to work on. What I felt was a returning enjoyment of the Science Fiction field. Thank you M.R. Forbes. And thank you Jeff Hayes. I listen to a lot of Audible works, sometimes five to ten a week. This has been a pleasure to review.Thanks for the opportunity. 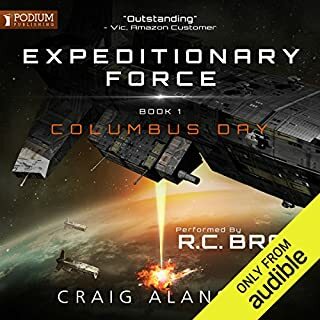 This audiobook was provided by the author, narrator, or publisher at no cost in exchange for an unbiased review courtesy of AudiobookBoom dot com. great plot, great narrator, exceptional ending! cant wait to start number 2. I enjoyed this book, it starts off slowly and builds up and towards the end you are on the edge of your seat. The girl lieutenant is really annoying trying to force herself onto Donovan. Her words just don't sound realistic and her voice is somehow false. What does Jeff Hays bring to the story that you wouldn’t experience if you had only read the book? The reader is good, it makes a lot of difference, he reads quickly but sounds as if he is actually enjoying the story. I have listened to some books and the reader sounds so bored that it puts you off listening. This guy is good. This is one of those stories that when you get to the end you head back to audible to see if you can get the second book. Lost cause - or humanity's hope? What did you like most about Man of War? The immediate opening of Man of War sets the stage for the rest of the book. It is tension filled but also beautiful, a race in space to collect a message from resistance fighters on an Earth now overun and occupied by a seemingly undefeatable a!ien race. 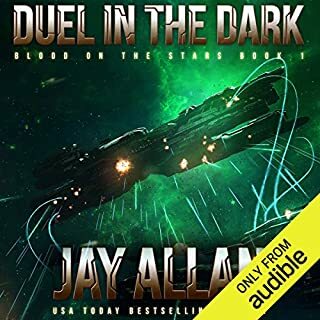 This book is more than just a fight-it-out-in-space story or a simple war for the planet between military and the invading armies. It is thoughtfully imbued with ideas of loves and loyalties, of how far to go before all must be found too much to continue, as well as providing exciting action and good characterisations. I have heard one other book read by Jeff Hayes and, as in that previous story, his range of voices in dialogue is remarkable and the text is impeccably given. He is easy to listen to and carries the story in complete complement with the author's writing. I love science fiction and read a lot, so it is refreshing to find a different approach to the 'them and us' scenario. This is the first of a new series and I will definitely be looking for the following book: there are so many possibilities opening up, i am really intrigued to see where it will take us. My thanks to Jeff Hayes who gifted me this book without any conditions. A bit slow to start, but it soon picked up. The only reservation I did have was the voice of the General. Ugh! That aside, I will look forward to Book 2. Slow start but turned out to be a thrill ride, steadily building up to the climax. Just brilliant and the performance was captivating! Rote, run of the mill, disappointing. Jeff Hays' performance left me cold. The book itself seems amateurish with many glaring errors. As ever with the first book in a series that Forbes writes. He lays a solid foundation for the narrative and it's characters which starts slow and methodical giving depth to it. The pace picks up in the last quarter and finishes leaving you wanting more... So on to book2..
Good yarn. Reminds of the book 'The Host' in a way. Enough action to keep it flowing.